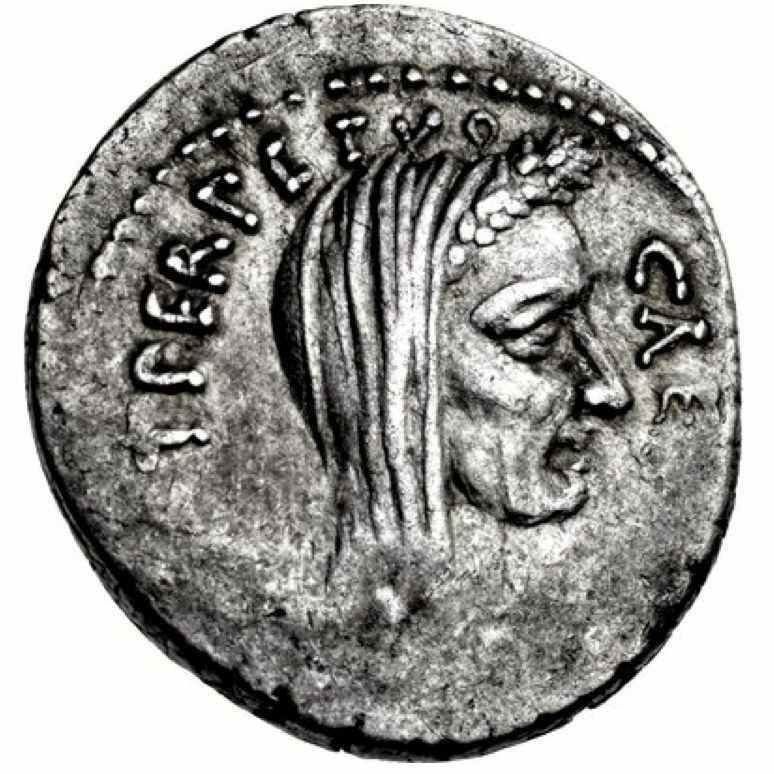 The Coin That Killed Caesar is the dramatic epithet attached to denarii, such as this example, featuring a lifetime portrait of Julius Caesar. Before that time, Rome’s coinage had never portrayed the face of a living Roman. Beyond breaking from numismatic tradition, these coins also proclaimed Caesar as dictator-for-life. It plausibly comprised the final straw that compelled anti-Caesarians to take matters into their own hands. Given Caesar’s obvious political savvy, it is curious that he did not foresee his growing peril. Previously, he introduced propagandist masterpieces such as his elephant denarius and his Venus/Aeneas denarius, both featured in this NGC Ancients Custom Set. Interestingly, Caesar was not directly responsible for his lifetime portrait coinage. The quattuorviri monetales produced them. Those four men (whose numbers had recently been increased from the traditional three) were moneyers responsible for supervising Rome’s coinage. One of those moneyers was P. Sepullius Macer, the issuer of this historically important coin. 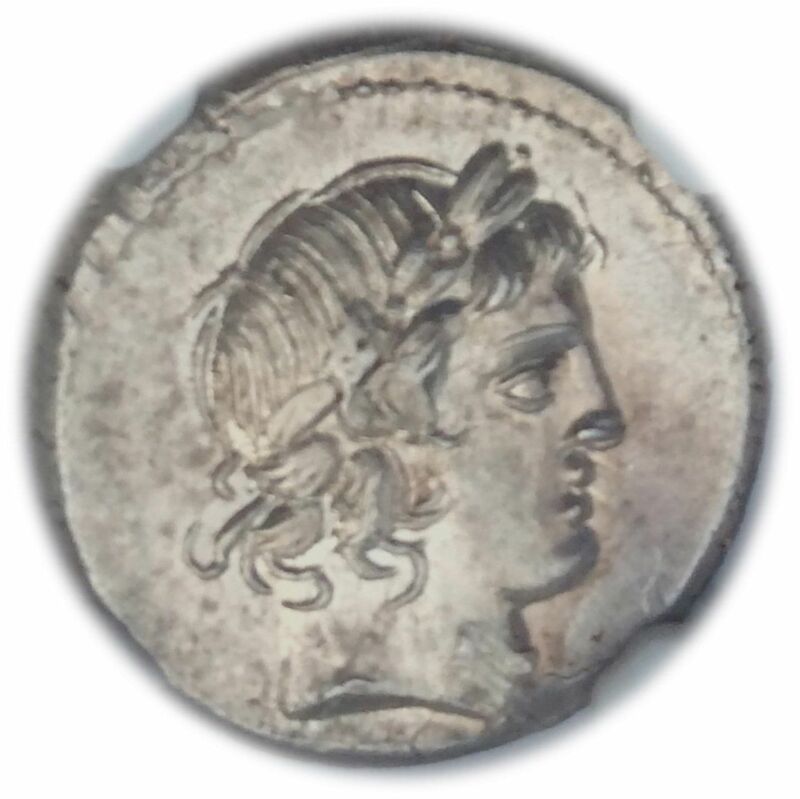 Like much of Caesar’s lifetime portrait denarii, this coin’s strike is slightly weak and off center, suggesting haste and urgency in its production. The obverse infamously features the veiled head of Julius Cesar, depicted in a highly veristic style, consistent with Caesar’s actual age and literary descriptions of his appearance. Caesar’s veiled visage has led to some speculation that this coin was struck posthumously. However, the obverse inscription, CAESAR DICT•PERPETVO, strongly suggests that the strike occurred the last month of Caesar’s life. In this case, Caesar’s veil probably reflects his position as Rome’s highest pontiff (Pontifex Maximus). The verso artistically returns to a more traditional Caesarian theme, featuring Rome’s counterpart of the Greek goddess Aphrodite. That goddess, who Caesar claimed as forebear, was Venus, representing various related aspects such as love, beauty, sexuality, fertility, prosperity, and victory. Specifically portrayed in this coin’s reverse is the goddess’ latter aspect, namely Venus Victrix. She stands above a shield on the ground, with Victory (the divine embodiment of the same) in her extended right hand and a vertical scepter in her left. The inscription P SEPVLLIVS MACER encircles and completes the scene. 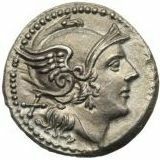 It is widely discussed that Caesar’s lifetime portrait coinage may have reflected the dictator’s aspirations for kingship. Even so, Caesar adamantly eschewed any comparison of his regime to monarchy. For example, Caesar thrice rejected a crown offered to him by Marc Antony at the Lupercalia (a Roman religious festival) held on February 15, 44 BC. In the end, Caesar’s efforts to mollify his detractors backfired - his infamous murder transpired just one month after this coin’s debut. Coin Details: ROMAN IMPERATORIAL, The Caesarians, Julius Caesar, February-March 44 BC, AR Denarius (17mm, 3.92 g, 3h), Lifetime issue, Rome mint; P. Sepullius Macer, moneyer, NGC Grade: AU, Strike: 3/5, Surface: 4/5, Obverse: Laureate and veiled head of Caesar right, CAE[SAR DICT•PE]RPETVO, Reverse: Venus Victrix standing left, holding Victory in extended right hand and vertical scepter in left; shield set on ground to right, [P SEPVLLIVS] MACER, References: Crawford 480/13; Alföldi Type IX, 40 (A3/R28); CRI 107d; Sydenham 1074; RSC 39; RBW 1685. Next entry Et Tu, KOSON? I had never seen that one before. Of course, I know little of these, but it is interesting that that was the first living person on Rome's coins. I hope this doesn't seem to be confusing, but to be comprehensive on this point, it should be noted prior to this time, there was one example wherein a living Roman was depicted on a Greek coin. That Roman was Titus Quinctius Falmininus, and the coin was a Greek gold stater that probably intended to honor Flamininus' 197 BC victory over Philip V of Macedon. There was also at least one provincial issue, from Corinth about 45 BC, that also shows Julius Caesar portrait, and also existed during his lifetime. So, when I say my denarius is an example of the first time a living Roman appeared on "Rome's coins", I mean first time a living Roman appeared on "official" Roman /Imperatorial/Imperial coins! Sorry to numismatically geek out here on the details here, but I thought I thought I would share more of my research! 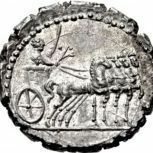 on the manlius torqatus denarii, in auction descriptions, they always describe the figure in the chariot on the back as "Sulla" in his triumph. Not true? Or that's not a portrait, so different standard? Or, he's Sulla, so it doesn't count? Nice find - did you get it raw? 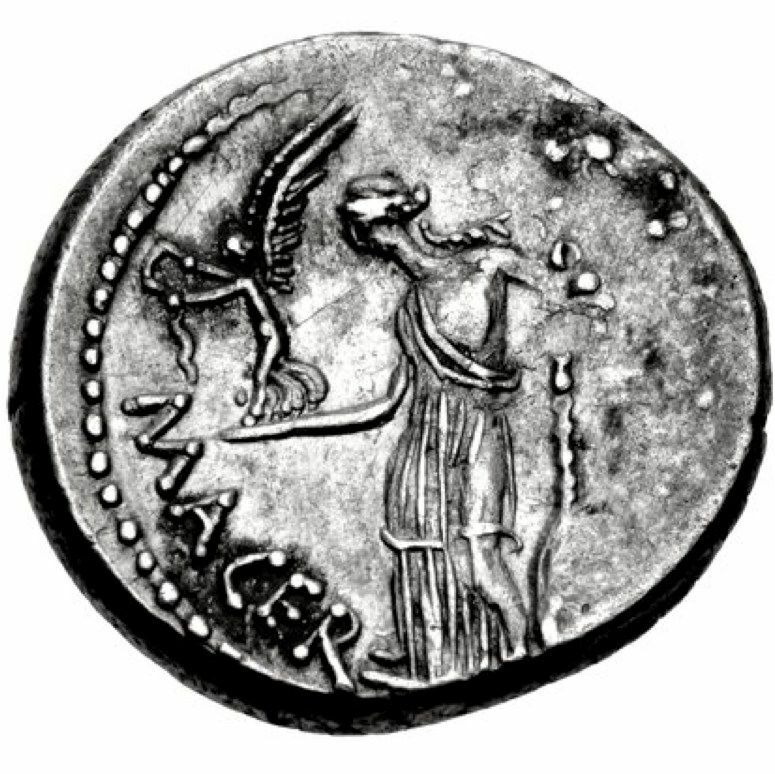 It is indeed true that a denarius struck by Sulla shows on its verso a figure riding in a chariot, and that figure - while difficult to identify - almost certainly represent Sulla. Since it's not a portrait, Caesar's lifetime portrait coinage is often described as the first time a living Roman appeared on Rome's official coinage. But that doesn't take away from Sulla's appearance in the chariot, its just that you can not unambiguously see his face to identify him. In my Owners's Comment I make the statement that prior to The Coin That Killed Caesar "...Rome’s coinage had never portrayed the face of a living Roman". 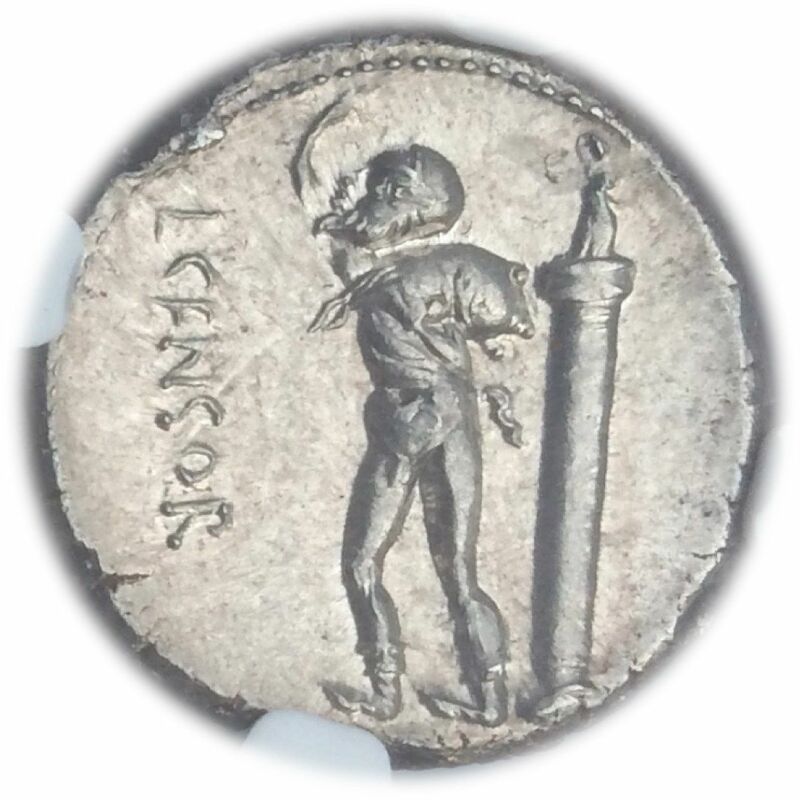 Since you make your excellent point, I decided to amend my comments to say "......Rome’s coinage had never portrayed the unambiguous face of a living Roman"
Regarding my acquisition of the coin, I was lucky to win at auction (after several failed attempts on similar coins that ended up selling beyond what I was willing to pay!). Of course, I was thrilled by the results bestowed by NGC Ancients graders. Returning back to the Sulla denarius, I actually also own that particular coin, and it is an important part of my Roman Empire collection since Sulla's rise to power as Rome's dictator in many ways paved the way for Caesar's rise, which in turn paved the way for Rome's transition from Republic to Empire. My next Journal Entry will feature that particular coin (which I purchased already encapsulated by NGC Ancients). When is the Sulla movie coming out? Especially in today's political climate, I would think his early years and longtime "girlfriend" would be popularly celebrated.